Some metaphors just refuse to quit. 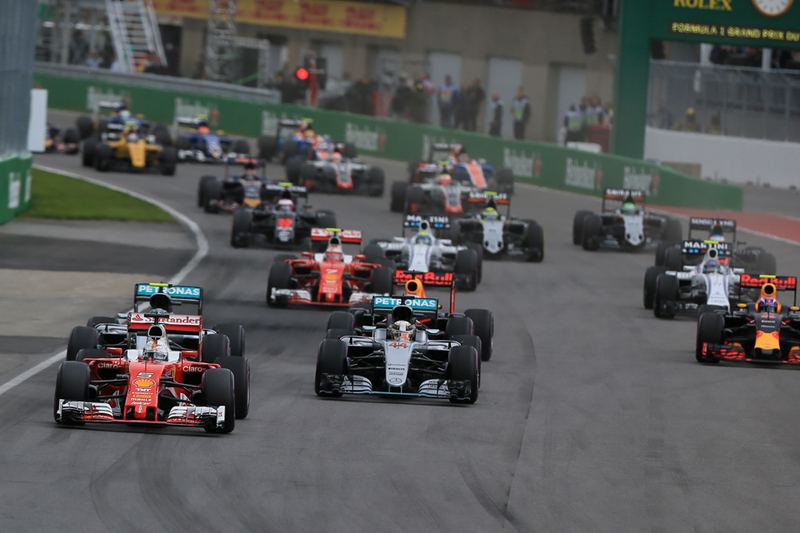 We said yesterday that in the Canadian Grand Prix's qualifying session, on an island known for groundhogs it was Groundhog Day. And the day after contained a few more goings-on with an unmistakable nag of familiarity about them. Just like last time out in Monaco a few things went Lewis Hamilton's way in the Montreal race. But just like last time out he put in a consistent and fast, largely flawless, drive to take advantage. Just like last time out he won the day. The upshot of all of this is that his championship deficit to his team mate and antagonist Nico Rosberg, a towering 43 points just over a fortnight ago, has been slashed to nine. He does have probable engine penalties to come, but his sudden sense of momentum is undeniable. As is the accompanying, and about as sudden, sense that you wouldn't now stake much against him bagging another drivers' championship this campaign. And the latest part of this swing came about in familiar style too, as also just like in Monaco Nico had a difficult day in traffic, and was consigned to tiddler points only. And it was related again to ceding a place to Lewis, though this time it was not so willing as it had been in the Principality. The parallels were far from done. In another echo with at least one previous round Sebastian Vettel's launch from the second row today was stunning, his Ferrari vaulting past the front row Mercedes duo in a blink to lead. This left the Merc pair side-by-side going into turn 1, Lewis on the inside. Lewis took a shallow parabola in the turn, and after a slight touch Nico who had been seeking to stick it out on his outside was forced off, a little like at Austin's first turn last season. Lewis said he had "massive understeer", but for all of the talk of car's widths in the regs also the car on the inside being able to hold its line and having something of a right to squeeze kicks around the sport's accepted practice somewhere too, and has done for a while. So it seemed again in the 'tough but fair' category. In any case, Nico should have realised that such is that turn 1-2 complex it was a move that to work required a very willing co-conspirator. And Lewis was never going to be that. In fairness Nico himself appeared to accept later that his team mate's move was just about within the rules of engagement - describing it as a "very hard racing manoeuvre", and that while he was "very pissed off in the moment" also "that's racing". The stewards agreed too, who didn't even investigate the matter. But its manifestation was harsh on Nico as with his momentum firmly checked he was down in P10 in a flash, his day already framed. Later too he was checked further by a slow puncture necessitating an additional stop, and his predicament was rather summed up by a furious scrap in the closing laps with Max Verstappen over fourth place. Young Max of course is not one reluctant to dice and he put his Red Bull in all of the wrong places as far as his pursuer was concerned. Then in his final attempt at the end of the penultimate lap Nico spun in desperation. He at least that time was able to get the thing going again without losing a place to come home fifth. As outlined his title lead remains albeit diminished, and if Lewis has a sense of momentum right now Nico instead has at the same time an equally unmistakable sense of things refusing point blank to go his way. Yin and yang. But back to the race at the front. As we know from years of priming to this effect when Seb has the lead he is not one easily dislodged from it, and the early laps kept utterly to type as he indeed looked comfortable there, aided by a Ferrari which is much closer to the Merc on race than on quali pace. Lewis indeed was scarcely clinging to his coattails. But quickly, unbelievably, Ferrari willingly surrendered the initiative. On lap 11 Jenson Button parked his broken McLaren Honda on the main straight which heralded a Virtual Safety Car. And Seb dived in for his first tyre change, and committed himself to two stops rather than the more expected one. Granted, doing so just as the Virtual Safety Car was ending saved him time in theory, perhaps around five seconds, but it seemed a classic case of taking a logical point to an illogical conclusion. Lewis now had track position and clean air - pretty much all that he wanted and especially so given the Merc's biggest weakness is running in turbulence. Observers soon concluded that the Scuderia had lost the race on the pit wall. Ferrari's strategy decisions were as tight as a drum in 2015, seizing upon each full or partial opportunity for maximum advantage. This year...they are much less so. 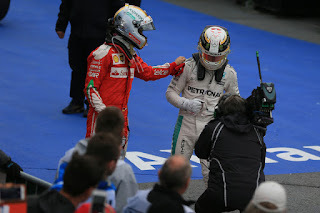 It is easy to criticise from the outside of course but we can add today's goings-on to the Australian and Spanish races that appeared in the palm of Vettel's hand, and that ended up as non-wins via a strategy choice that was accompanied by most onlookers scratching their heads. Each of them have shared a family resemblance too, in the sense that all have been the upshot of Ferrari being rather too aggressive in its selections. I recall it being said earlier in the year that the Italian team, for whatever reason, is feeling pressure lately to go for hare rather than tortoise approaches. It's particularly ill-fitting given James Allison machines are known for being gentle on their rubber. The team though explained that this time it was a simple miscalculation of likely tyre life. 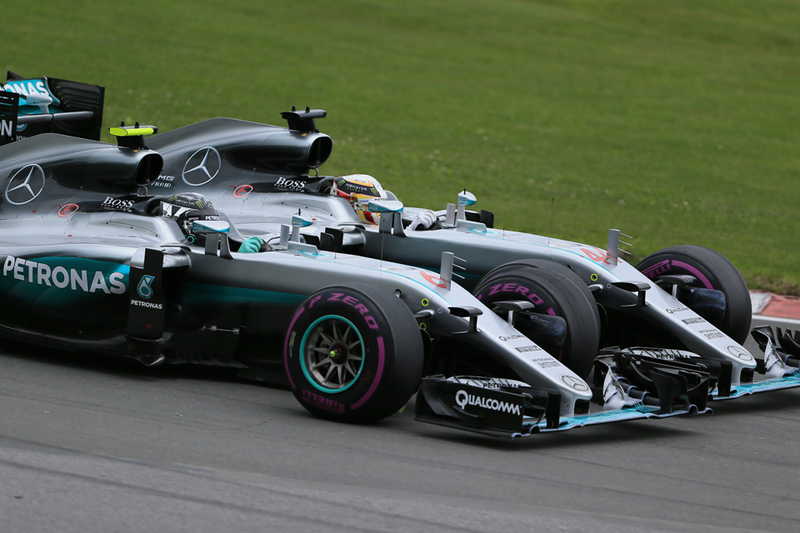 "We overestimated the degradation of the tyres," said team boss Maurizio Arrivabene. "That's the reason why we called him in and it was the wrong decision. We don't have to make the story bigger than it is. Today we made a mistake." Vettel concurred. 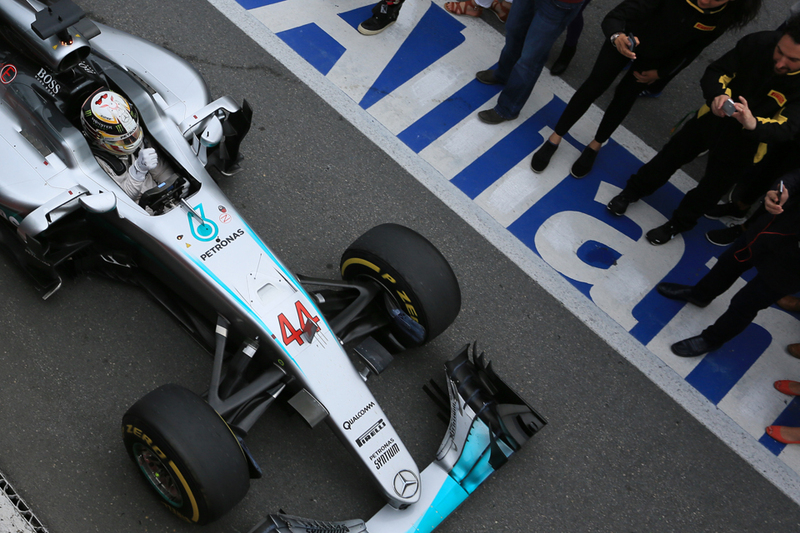 "We committed fairly early to a different strategy...probably the tyres lasted a bit better than what we expected". Whatever though, it remained a clanger. This all left Lewis in the lead, and he armed with his W07 knows how to keep it. Vettel continued to try hard and his pace remained impressive even on very second hand supersofts at the end of his second stint. For a time too in his final stint it looked like he might just make things interesting, as he chipped at Lewis's advantage from 7.5 seconds down to just over four. Projecting forward it wasn't though going to be quite enough to catch the Merc by the end, and the point became moot when Seb on lap 56 with 14 left missed the final chicane. It lost him 1.4 seconds in the immediate term and more pointedly lost him any sense of momentum. From then on the result was in little doubt. Lewis insisted though that it wasn't in doubt anyway, as he had things under control. "[I was nervous] only at the beginning" he said, "I really don't understand what's going on with the start...after that it was really trying to hunt down Sebastian, I think we both had really good pace. "Other than turn 10, when I had a slight lock-up which I just released and ran a little bit wide, I didn't make any mistakes, so I was really happy after that. Great strategy, looking after the tyres, the team were right on the strategy call. I can't really believe it's gone as well as it has, but I really enjoyed the race...The yellow tyre [the soft that he did his second stint on] was just sweet. "It felt like I was floating", he said referencing his dedication of his win to the recently departed Muhammad Ali. "Every time he [Vettel] did a good lap I was able to put another in, which I'm sure was painful for him! In terms of like a sting..."
On days like this I wonder if in the round we sell Lewis somewhat short, as for all of the things we've grown to associate with him - the pace, the bravery, the sheer gaudiness in and out of the car - he in fact does the dull stuff very well too, and almost without fail. Managing a race out front; stretching out a lengthy tyre stint. He did these perfectly today. And while Seb missed the final chicane on three occasions Lewis - aside from running a bit wide at the hairpin once as mentioned - made no mistake that I can recall. "Really smooth, kinda just in the groove" is how he described it. It looked that way. As for Lewis's take on Ferrari's now-infamous strategy move? "I definitely was surprised". Yet for all of the talk of Ferrari strategy, Vettel had a simpler explanation for the result. "Lewis was a bit too quick, that was the issue," he said. And he looked on the bright side. 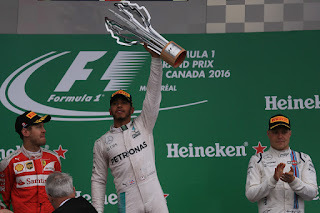 “I was pushing all race...overall it was a great weekend for us. “We struggled a little bit the last couple of races, and now we see the car has performance and we unleashed it - it was a really fun race." Indeed, Ferrari appeared this weekend to return to form as well as might just have solved its notorious qualifying tyre warm-up woes. 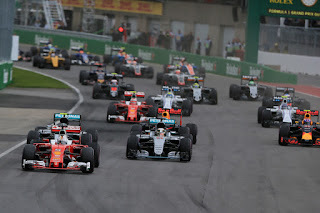 It has an immediate opportunity in Baku also to demonstrate that it wasn't all a peculiar result of Montreal's chilled conditions. The sense of repetition in Montreal wasn't over even so. Valtteri Bottas, just like 12 months ago, stayed out of trouble and put a one-stop strategy to good use to bag the final podium place, at a circuit that suits the fast-through-the-air Williams. And once again Carlos Sainz deserves a shout out, after starting in 20th - a gearbox penalty adding insult to the injury of his quali crash - he moved through to P9 by the end. Red Bull was about the only one to vary from what had gone before, as its strong recent form was rather halted today. The Milton Keynes pair with Verstappen ahead couldn't stay with the leading duo then had to switch to two-stop strategies due to excessive tyre wear. 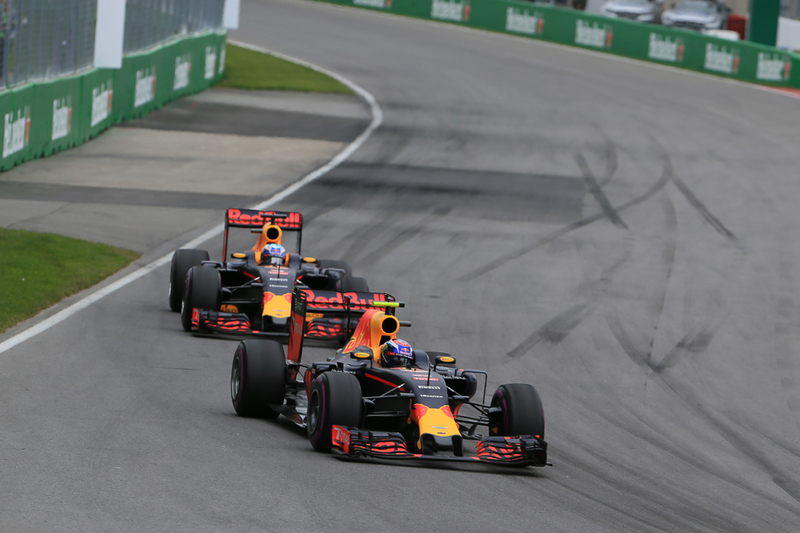 In Daniel Ricciardo's case him flat-spotting a tyre meant an earlier than ideal second halt. He only got P7 while Verstappen, bouncing back well after Monaco and all that, got fourth. But out front, there is a more elongated bounce back going on, and from Lewis Hamilton. Another thing that has a nagging sense of familiarity about it.